At Chinmaya Dharamsala..Spiritual Retreat, Hindu Ashram-Vedic Meditation, India. 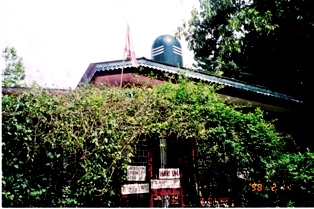 Swami Chinmaya Dharamsala...A Hindu Ashram! Nestled in the spectacular Dhauladhar ranges of the Himalayas is the Chinmaya Tapovan Ashram. It is, one of the main retreats of the Chinmaya Mission. It is important as a center of the Sandeepany Vedanta course, meditation camps,vedic teachings and the Chinmaya Rural Primary Health and Training Center. This ashram is special as this is also Swami Chinmayananda's last resting-place, who attained 'Mahasamadhi' in August 1993 . Today this Himalayan Ashram in Dharamsala is famous for the Vedic Teachings of this great saint ! 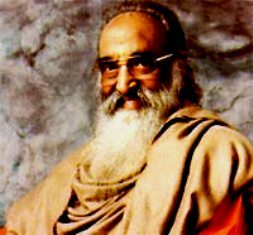 The future Swami Chinmayananda was born on May 8,1916 in Ernakulam, Kerala.He was born in a aristocratic family, which was deeply pious. Daily evening prayers were a family activity and sages and other holy people were regular visitors in their home. Balakrishna grew up in a spiritually charged atmosphere. 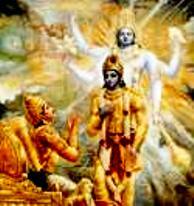 Although he enjoyed the chanting of mantras, doubts lingered in his mind about what was religion all about. 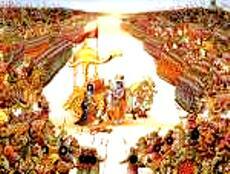 He wanted to know whether there existed a greater truth behind all the ritualistic traditions. In 1940, he joined Lucknow University and took up the study of English Literature and law. Inspired by the Quit India Movement of 1942, he soon found himself immersed in the country's freedom struggle for which he even spent time in prison. The need for self-expression combined with the zest of the freedom struggle saw Menon shifting to Delhi to join the nationalist paper, the National Herald, in 1945. The Ashram is named after the Guru of Swami Chinmayananda, Swami Tapovan Maharaj. It is located in the scenic Himalayan mountain ranges, with its cool climes and fresh air, far away from the madness of city life. 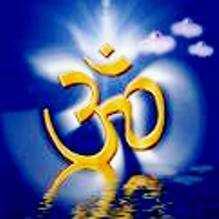 The ashram provides the environment necessary for meditation, spiritual fulfillment and introspection. People in search for spiritual pursuits, make their way to this ashram from all across the country and the world. So, if you are looking at a dash of spirituality in your life, this the ideal place. The ashram will provide you guidelines and practical means for spiritual enhancement.This could be a turning point in your life, just like the one that came into the life of Balakrishna Menon when he reached the Sivananda Ashram! The Courses at Chinmaya Dharamsala.. The ashram holds short duration courses on the holy 'Bhagavad Gita' (the sacred book of the Hindus), and trains health workers to look after the health needs of the villagers living in the Kangra valley. The ashram has a huge discourse hall, ideal for discourses on the Gita. Also located inside the campus is a bookshop, which houses literature on Hindu religion besides recorded music and discourse cassettes. 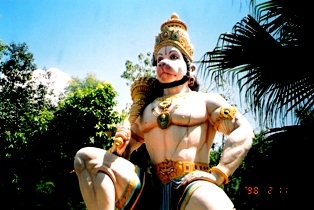 As one approaches the ashram, a huge idol of the monkey God Hanuman meets the eye. He is stands guard at the ashram gate. This is the reason why the ashram is also called the Sidhabari Ashram, named after Lord Hanuman. "That which has no Beginning nor an End is Immortal !" For More on Chinmaya Dharamsala..Go to Dalai Lama -Dharma !